The rise of the online Bitcoin casino market has brought several new directions in the game selection portion of the casino offer. Most Bitcoin casinos tend to favor fewer and simpler games over a host of many “subpar” titles, sticking to smooth performance and Provably Fair features. 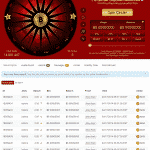 This is the case with Satoshi Circle, a Bitcoin casino which offers just one game – the Satoshi Circle. Unlike many other Bitcoin casinos however, Satoshi Circle has a deep and meaningful progression system which unlocks rewards, more rewarding “wheels” and so on. While the progression is the main hook for new players, the site also offers additional features including instant deposits via a unique Bitcoin address, Provably Fair for maximum fairness, excellent performance and graphics, as well as very low house edge. Satoshi Circle is dominated by the red color theme which is not overly complex nor detailed, but presented in a way that is pleasant to the eye and will not become boring even after longer playing sessions. The great thing about it though is the organization – everything is easily accessible and in plain sight so you don’t need to navigate through menus and additional queries to get the information you seek. The game itself is of simple design but only on the surface – playing for a while unlocks new wheels which change the design and reward outcomes, adding another layer of detail that is not present in similar games like Roulette for example. Satoshi Circle works perfectly on browsers, without loading times or performance hick ups. The mobile version is also fairly optimized and will give another incentive to play while on the go. The most attractive of the bunch are of course, the new wheels which as described above, offer up to 15x in rewards for the player’s wager. Players start with the regular 3x wheel and with playing can unlock more rewarding wheels. The game play of Satoshi Circle is similar of that in Roulette, i.e. the player “spins” the wheel and depending on the outcome, his/hers balance will be multiplied by a factor above 1.0x or bellow 1.0x. Ideally, hitting the greater multiplier or 3x in the beginning will bring the highest return in profit. Satoshi Circle contains 5 different wheels which are unlocked as the player progresses. At the start, only 2 wheels are available, with multipliers going up to 3x. The best circle contains up to 15x multipliers (the maximum). One thing to remember when on looking for a new Bitcoin game to play is to consider the very low house edge of Satoshi Circle – 1.76%, which is highly inviting once you compare it to most Roulette tables which have a house edge of 5.26%. Last but not least, the wagers for Satoshi Circle can be spread out starting from 10%, 25% to 50% and max bet. The maximum amount per spin is set at 0.25 BTC at a time. Contacting the customer support team at Satoshi Circle is possible via their dedicated email on the official website, or via forum chat on the BitTalk forums. They are prompt to answer any requests or questions, as well as pending rewards from playing the game. Like most Bitcoin casinos, Satoshi Circle has an embedded Provably Fair option that lets players test the accuracy and fairness of wheel spin outcomes. The process involves a bit of knowledge of algorithms and programming, though the main thing to note is the “proof” you get before the spin which can be paired with the result to check for fairness. Without the need for an account and a unique Bitcoin address awarded to each new visitor, making a deposit at Satoshi Circle is safe and instantaneous. Withdrawal of winnings takes up to two additional confirmation to process, which is an added layer of protection. 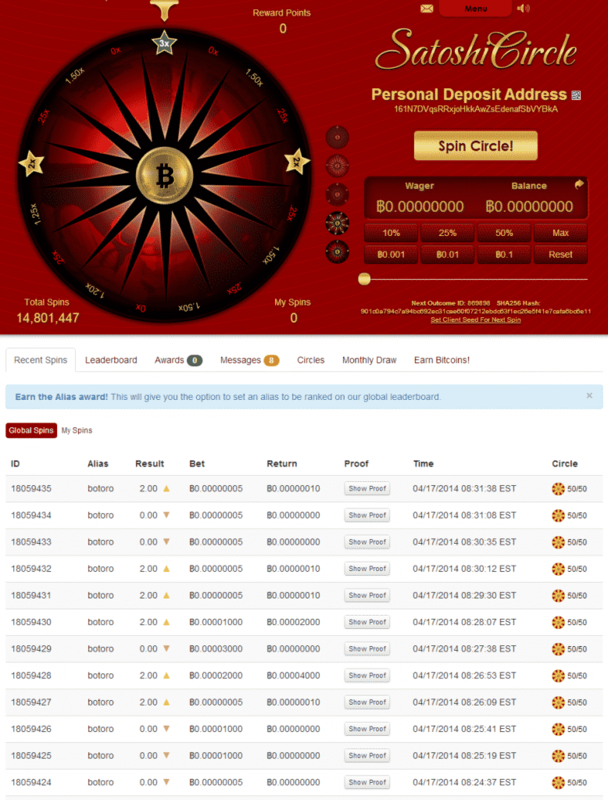 Satoshi Circle has all the elements that add up to an excellent and inviting Bitcoin casino experience – an easy to play game with a rewarding progression system, many rewards, optimized and defined features, secure and fast transfers, as well as capable and responsible customer support.